The data above shows us that these more talented teams do not have to implement basestealing as a large part of their offense. 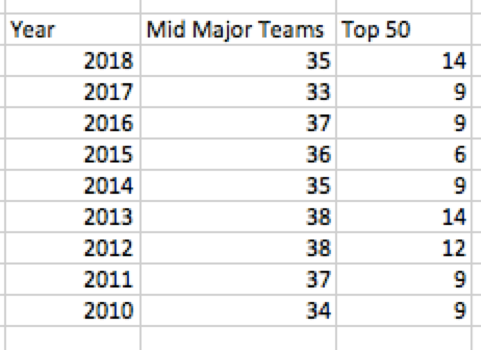 There were three Power 5 teams that were ranked in the top 50 in 2018. The rest of these schools use power numbers and pitching to thrive throughout the season. The schools that utilize stolen bases are not the schools that have three or four guys that will hit 10-plus bombs in one year or do not have starters that throw 93-96 that can go seven innings on any given day. The teams that are utilizing the running game are those that need an extra weapon in their game to set them apart from other teams similar to them. I don’t believe that stealing bases is on the decline, but I do believe guys are starting to become better hitters, pitches and athletes, and the schools that are able to get those guys (Power 5 Conferences) do not have to implement stealing bases into their program. They can allow guys to do what they want with their game. 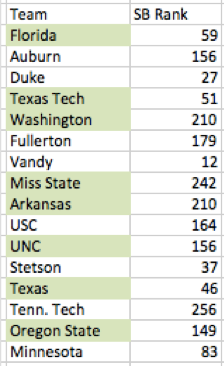 This graph shows the number of mid-major schools that were in the NCAA Tournament that were also in the top 50 in stolen bases each year. There was a bit of a drop off in 2014 similar to the drop off in stolen bases per game in Division I that same year. Four-to-five years ago is when coaches were not willing to take the risk of stealing bases when analytics started to be implemented in the college game. Now these mid-level programs are starting to realize they need something to set them apart from others like them and start competing with those bigger schools. UCF has implemented stealing bases in their offense for years now, and in the 21 games they played against ranked opponents in 2018, they were able to win 11 of those games. They stole 16 bags in those 11 wins, which led to 11 runs scored, and six of those games were decided by two runs or fewer. They are able to put pressure on defenses with the run game and stealing bases is one of the reasons they are competitive year after year. These disadvantaged schools that are not Power 5 conference teams should be implementing stolen bases as a bigger part of their offense. Adding another weapon to their arsenal can help these mid-major teams compete on the national level. 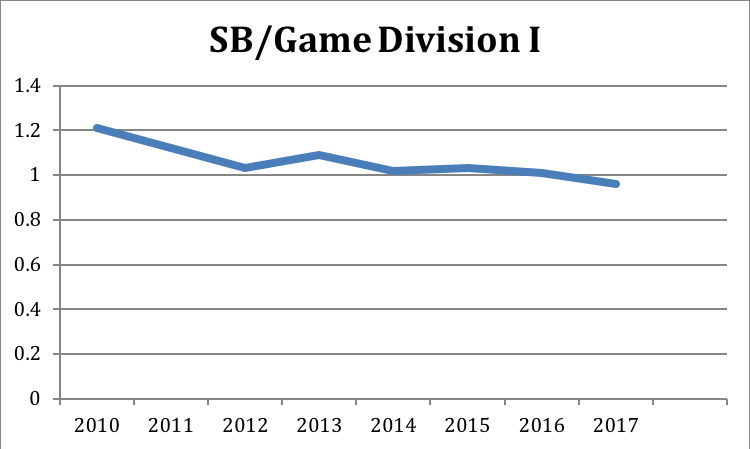 It will be interesting to see what stolen base trend will occur in college baseball 2019, but hopefully teams will start to swipe more bases to contribute more to the recent increase in scoring at the Division I level. We hoped you liked reading The Evolution of Stealing Bases at the College Level by pwells31! Good written article guys! Keep up the good work! It should be added to this page https://en.wikipedia.org/wiki/World_Series , it’s that good!